Beautiful and delicious looking and, once again, using your own "harvest". How satisfying! 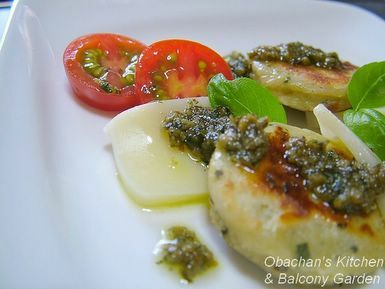 Obachan, I love your blog. It's so entertaining and your personality comes through so clearly. That's why I keep you on my "favorites" list. "It was such a shame that I was too hungry to be more artistic." ROFL! you're so funny obachan. I've also found that, when making fresh pasta from a recipe, the dough is too damp and sticky after added all of the flour called for, I usually end up having to add an extra cup! I know very little about Italian tradition, but I’ve seen many pesto recipes calling for “pine nuts or walnuts,” so I guess using walnuts is a popular idea. About the flour-- here in Japan, we have to be careful with European recipes because our 1 cup is 200 mL, so when we add flour using our measuring cup, it is usually much less than what is necessary. But other than that, I assume that there is a difference in the flour itself, because I sometimes end up with damp and sticky dough or runny batter even when the amount of the flour in the foreign recipe is in grams. oooh that looks sooooo good!! Basil is my FAVOURITE herb. 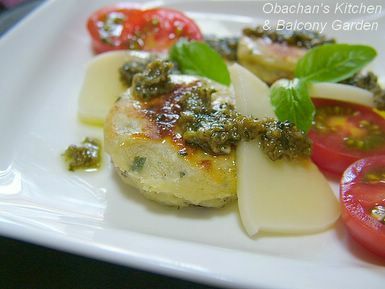 Anything with basil is good! I agree that making pesto with a mortar and pestle is the best - because you're crushing the leaves, not chopping them, more flavour is released. I loved pesto so much that I started planting my own basil as it was cheaper than buying basil to make pesto everytime XDD. 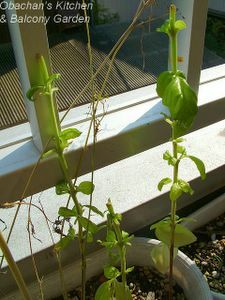 But what I learnt is that you have to be brutal to your basil to make it grow better and bushier. Simply plucking off the leaves won't do - it'll end up looking thin and skinny - have to keep cutting the stems. I also like to use the flowers to decorate my dishes - and off course it prevents seeding thus prolonging the life of the plant ...whee! Thank you for your support for the mortar-and-pestle method. Now I don’t feel like I’m a caveperson any more. ;) Talking about basil flowers -- my basil didn’t have a chance to bloom this year. Poor thing. Next year I’m going to use a bigger planter for basil... and be more brutal to them. Your blog is right near the top of my favorites ... if I have time for only two "reads", your's is one of the two. Now ... I think I'm older than you, so I'll adopt you, and you can come live in Los Angeles, and feed me these lovely meals ... if they taste half a good as they look, I'll be out-of-my-mind with glee. Please keep tending your 'mini-farm', cooking, taking beautiful photos, and blogging the results. Sounds delicious! 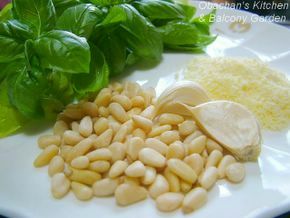 Wow, I really want to make gnocchi myself. I wonder if I could put red enchilada sauce on omuraisu too! This was my first time trying pan-fried gnocchi, and I might say I like them better than boiled ones. I’m very surprised with my omuraisu post… It’s a pretty old post but I still keep receiving comments there once in a while. The picture of your naked basil plants made me laugh out loud! I'm pretty new to this blogging thing and have found myself in a similar predicament many times... next time I'll be more brave about sharing my lapses. What a beautiful site. And I agree with another comment, that your personality comes through so beautifully. So many blogs, even very informational and substantial ones leave me so flat. This one is alive and vibrant, funny and informative, and full of good stuff! Thank you, thank you! I'll be back. You have a very interesting blog that covers many topics I am interested well. I just added your site to my favourites for power in the future.